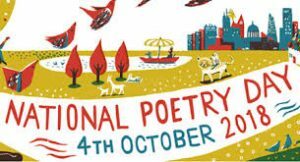 Bradford poets celebrate National Poetry Day 2018. Poets from across the district come together on Bradford’s Big Screen to mark National Poetry Day. A selection of the poems will also be shown at 5 mins and 35 mins past the hour throughout the day. If you can’t get down to the screen you can watch the films here. Please note they are in alphabetical order of first names. After the Raging by Barbara Howerska from Bradford UNESCO City of Film on Vimeo. Consumed by the Fallacies by Bernie the Bolt from Bradford UNESCO City of Film on Vimeo. An Old Mill by a Stream by Brian Collier from Bradford UNESCO City of Film on Vimeo. Change? by Bruce Barnes from Bradford UNESCO City of Film on Vimeo. Saturday Morning by Carol Clayton from Bradford UNESCO City of Film on Vimeo. Hooray for Hats by David Driver from Bradford UNESCO City of Film on Vimeo. The Tooth Fairy by Florence Remmer from Bradford UNESCO City of Film on Vimeo. Birth Plan by Gill Lambert from Bradford UNESCO City of Film on Vimeo. Morning (Dedicated to the memory of Jonny Walker) by Kathleen Strafford from Bradford UNESCO City of Film on Vimeo. Bradford by Kevin Flaherty from Bradford UNESCO City of Film on Vimeo. Change by Lorna Dunsire from Bradford UNESCO City of Film on Vimeo. Gabriel the Undertaker by Mark Connors from Bradford UNESCO City of Film on Vimeo. Dream On by Marian Barker from Bradford UNESCO City of Film on Vimeo. Portrait of an Artist (Pool with Two Figures) by David Hockney 1971 by Nicholas Bielby from Bradford UNESCO City of Film on Vimeo. The Fabric of Life by Pam Benfield from Bradford UNESCO City of Film on Vimeo. The Drum also Dreams by Rosalind York from Bradford UNESCO City of Film on Vimeo. Time for a Change by Sally Tottle from Bradford UNESCO City of Film on Vimeo. Heaven by Samar Shahdad from Bradford UNESCO City of Film on Vimeo. To a Dandelion by Sarah Corbett from Bradford UNESCO City of Film on Vimeo. My Library by Shareena Lee Satti from Bradford UNESCO City of Film on Vimeo. The Lines of History by Sheena Hussain from Bradford UNESCO City of Film on Vimeo. The Risk Not Taken by Steve O’Connor from Bradford UNESCO City of Film on Vimeo. Three Summers by Sue Vickerman from Bradford UNESCO City of Film on Vimeo. Changing Moons by William Coniston from Bradford UNESCO City of Film on Vimeo.